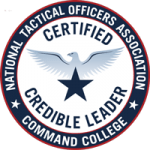 The One Star NTOA Certified Credible Leader program is designed for those who wish to be certified and recognized at the international level. Certificate – An 11×14 professional certificate suitable for framing. Letter of Accomplishment – A letter of accomplishment mailed to the candidate recognizing him or her as a One Star Credible Leader. P1TLCM02 Lincoln on Leadership – Requires a textbook: “Lincoln on Leadership: Executive Strategies for Tough Times” by Donald T. Phillips. P1TLCM10 It’s Your Ship – Requires a textbook: “It’s Your Ship: Management Techniques from the Best Damn Ship in the Navy” by D. Michael Abrashoff. P1TLCM12 Founding Fathers on Leadership – Requires a textbook: “The Founding Fathers on Leadership: Classic Teamwork in Changing Times” by Donald T. Phillips. P1TLCM14 It’s Our Ship – Requires a textbook: “It’s Our Ship: The No-Nonsense Guide to Leadership” by Captain D. Michael Abrashoff.